On Saturday 8th December Ricky “The Hitman” Hatton will be fighting “Pretty Boy” FLoyd Mayweather for the WBC Welterweight title of the World. This fight will be taking place at the MGM Grand Arena, Las Vegas of course all the tickets have sold out but most MGM Grand Properties will be offering live CCTV coverage of the fight but tickets just to watch on a screen are $100 each ! With both fighters undefeated and around 20,000 British fans flying out to Vegas this will be one of the biggest Vegas events of the year, the atmposhere will be electric and this will not be limited to just the arena all of Vegas will be buzzing, it will also be very crowded and I suspect many very drunk Englishmen. 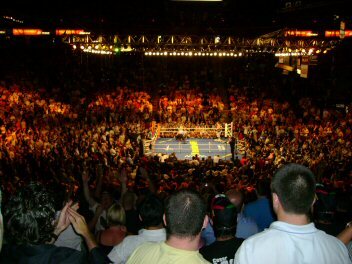 Boxing is just one of the events that draws huge crowds to Vegas this makes everything crowded and room prices go through the roof. When planning your Vegas trip its well worth checking out what is on, if you can be flexible on your dates you can save a fortune. I have booked 3 nights at the MGM Grand from the 21st December for $247 there are no rooms available this weekend but if there were the cost for three nights would be well in excess of $1000. On big weekends such as these not only does the Strip grind to halt with traffic nose to tail from Mandalay Bay – Circus Circus but foot traffic through the Casinos is very busy and you tend to find that you are shuffling through the walkways and it takes and age to get anywhere. Personally I prefer the quiet weekends. 3. Allow extra time to get to any shows or dinner resevations when ist busy it can take an extra 10 minutes to get from your room to the taxi rank. www.restaurant.com has a 50% off sale and with each order you get a $10 gift certificate. The code to use is SNOW. The email I received states that the code for your free $10 Gift Certificate will be emailed to you within 24 hours. The offer ends December 9, 2007. There are a lot of Las Vegas restauarnts on the list so this might be useful to somone. Looks like the recession is really biting here in Vegas – the doors are due to open in a few minutes and there are still loads of tickets available. I’m hoping to pick up one on the cheap, but otherwise will get one from the box office . Should be a great evening!